During the course of our lives there are certain days that will claim extra and special preparation. I remember one Christmas Eve, I think I was about 14 at the time, when I voluntarily cleaned my bedroom and went so far as to collect jasmine from the garden and place it in a vase on my freshly excavated chest of drawers so that I would wake up on Christmas morning in a room that was beautiful in every way. That's just one Christmas. Most Christmases get special attention - practical and spiritual. Easter too. There were special preparations leading up to our wedding day and also for the days our sons were born - practical preparations so that these days would go well but spiritual preparations too, hoping that what we said and did on these occasions would maybe whisper the gospel into someone's listening, searching ear. But what about the day of our death? A bit hard to prepare for in lots of ways. Death may come suddenly and unexpectedly. Or it may come at the end of a long, slow illness or at the end of the gradual process of aging, leaving us too debilitated and tired by the time we get there to do much about it. But what is death? For the Christian it is the day we fall safely into the arms of Jesus. That last breath drawn marks the beginning of glorious, eternal life with our Father in heaven. 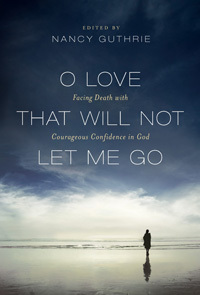 I have recently finished reading O Love That Will Not Let Me Go, the fourth book edited by Nancy Guthrie in a series of collected readings on a given subject. This one is on the subject of death and bears the subtitle Facing Death with Courageous Confidence in God. And like the others, it's wonderful. It isn't easy reading in lots of ways. The various writers don't make light of the physical reality and pain of death which makes this book very confronting. Nor do they make light of the sadness and tragedy of death. Jesus himself wept when his friend Lazarus died - weeping not just for the loss of his friend but also over death itself, that His Father's perfect creation had become so stained and sullied by sin as to be marred by the ugliness of death. For the one who dies loving Jesus, death has lost its sting. Because when the last breath of life is drawn, the Christian passes away from this life into eternal life with Jesus. And while this book has plenty to say about the pain of death, it has more to say about the wondrous glory of what lies beyond it. Therefore, if we desire to end our days in joy and comfort, let us now lay the foundation of a comfortable death. To die well is not a thing of that light moment as some imagine: it is no easy matter. But to die well is a matter of every day. Let us daily do some good that may help us at the time of our death. Every day by repentance pull out the sting of some sin, that so when death comes, we may have nothing to do but to die. 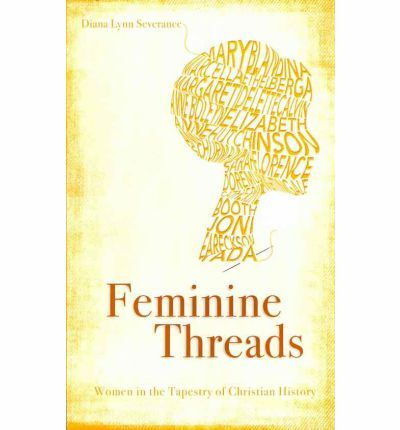 As I said, this book is confronting in many ways. But it is also rich with comfort, encouragement and hope. As for all the books in this series, it is definitely worth reading. And reading it would be time well spent. Drinking...a cup of tea. I was recently introduced to black tea with mint. It's delicious. But the weather was too awful to head outdoors for mint leaves today so this is just the usual English Breakfast with a dash of milk. I've actually reduced the amount of tea I drink lately...and feeling much better for it too. Thinking...it has been a long time since I posted anything. Watching...Masterchef and have absolutely loved following the progress of a dear friend's sister competing on it. But I will be SO glad when Sunday's finale is screened, the tv can be turned off (for a very long time) and the evenings can be reclaimed. And to the young member of this family who asked if we were going to watch "The Renovators" next, the answer is no. Falling behind...in my daily Bible reading. (This however is not linked to the "Watching.") About a week behind at the moment. Hoping to have caught up by the end of the month. Currently in Chronicles, the 20s Psalms and Mark. And loving our current sermon and Bible study series on Deuteronomy. Wondering...if anyone has used the M'Cheyne Bible reading plan and if so, what you thought of it? I'm wondering if I will give it a go for next year. 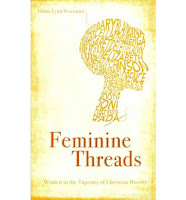 Reading..."Feminine Threads: Women in the Tapestry of Christian History" by Diana Lynn Severance. I'm fairly sure I'll be mentioning this one again. Spurred on...by a post I read about looking to God in prayer for grace for the immediate now and not being concerned with or distracted by the list of things that need to be done by the end of this week or next week. I can seek His grace for the end of the week things at the end of the week. It's trying to live out Matthew 6:34. Therefore do not worry about tomorrow, for tomorrow will worry about itself. Each day has enough trouble of its own. Anticipating...writing a post on an excellent book I read during the holidays. Soon. Maybe after Sunday!!! Copying...Rebecca and trying to decide if I will do a status report every month.